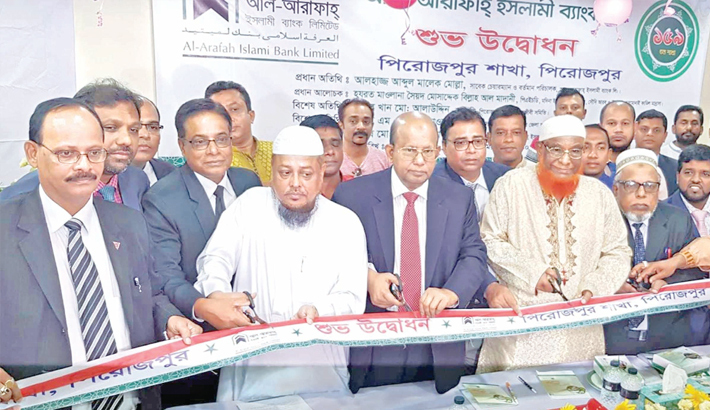 Al-Arafah Islami Bank Director Abdul Malek Molla opens a new branch of the bank in Pirojpur on Thursday. Al-Arafah Islami Bank Limited opened its 159th branch in Pirojpur on Thursday. Director of the bank Abdul Malek Molla inaugurated the new branch as the chief guest, said a press release. Managing Director Md. Habibur Rahman presided over the ceremony. Principal of Charmonai Alia Madrasa Maolana Syed Mosaddek Billah Al Madani and Executive Vice President and Head of AIBL Khulna Zone Md. Manjur Hasan addressed the function. Among others, President of Pirojpur Zila Ainjibi Samiti Khan Md. Alauddin, Secretary Syed Sabbir Ahmed, Ex-President MA Hakim Howladar, President of Pirojpur Chamber of Commerce Ataur Rahman Sheikh Alam, Ex-VP of Pirojpur Sohrawardi College Seikh Firoz Ahmed were present. The ceremony was organised by Executive Vice-President Engr. Md. Habib Ullah and Vice President Jalal Ahmed.